It is not our intention to discourage or encourage vegetarianism. Diet is a matter of personal choice and it would be against all occult and human laws to interfere with the personal freedom we all possess as sons or daughters of God. Our aim is to investigate the subject from the standpoint of occult science in our usual way by presenting you with facts, not fancies. It is entirely up to you whether to accept them or not. Ever since the beginning of the 19th Century, many spiritually-minded people have embraced vegetarianism and made many claims for the spiritual benefits of a vegetarian diet. None more so than spiritualists and theosophists, who widely believe that eating meat coarsens the body, stifles intuition, inhibits psychic powers and retards spiritual progress. A very common belief among many mystics, both East and West, is that by eating the flesh of animals we assimilate the characteristics of the animal it came from. Another widespread belief is that vegetarianism generates 'good' Karma. In the course of this investigation we aim to prove that all these assumptions are false. We know that we go against a host of spiritual teachings and 'authorities' when we say this, but nevertheless we speak the truth. We say this not only from our own, personal experience, but also because all the great spiritual Teachers of the past have said the same. Is vegetarianism necessary for spiritual progress? Many of the assumptions mentioned above can be traced to misinterpretations of the teachings of the 19th Century occultist, H. P. Blavatsky and her followers and imitators. In section 13 of Blavatsky's The Key to Theosophy, which is written in the form of questions and answers between an occult student and his teacher, Blavatsky says: "...when the flesh of animals is assimilated by man as food, it imparts to him, physiologically, some of the characteristics of the animal it came from. Moreover, occult science teaches and proves this to its students by ocular demonstration, showing also that this 'coarsening' or 'animalising' effect on man is greatest from the flesh of the larger animals, less for birds, still less for fish and other cold-blooded animals, and least of all when he eats only vegetables." The student's response to her answer is interesting. He asks: "Then he had better not eat at all?" To which Blavatsky replies: "If he could live without eating, of course it would. But as the matter stands, he must eat to live, and so we advise really earnest students to eat such food as will least clog and weight their brains and bodies, and will have the smallest effect in hampering and retarding the development of their intuition, their inner faculties and powers." On the face of it this seems an unequivocal vindication of vegetarianism and it is often quoted as such by vegetarian mystics in support of their beliefs. But if we examine Blavatsky's statements more critically a rather different picture emerges. Firstly we should consider the times in which this book was written and the social classes to which it was addressed. When the book was published in the late 19th Century the upper and middle classes in both Europe and the United States ate huge amounts of meat and very few, if any vegetables. Their main meals comprised a minimum of three courses and often stretched to six or more, which often included more meat. Is it any wonder that their poor bodies and brains were 'clogged' and their senses coarsened and dulled by this habitual over-indulgence? Excessive alcohol consumption must be taken into account too, for each course had its appropriate wine, not to mention the whisky-sodas that preceded dinner and the port and brandy that invariably followed it. Those who quote such writings are generally unaware that H. P. Blavatsky was a meat-eater for most of her life. Is this a case of 'do as I say, not as I do'? Some might conclude it is, but as she also told her students that "purely bodily actions and functions are of far less importance than what a man thinks and feels", we think it is rather the case of suiting her words to her students, many of whom ate the equivalent of a 16oz steak for breakfast, lunch and dinner! Such prodigious excesses cannot be good for the body or the mind. Much the same applies to consuming 10 litres of carrot juice a day, or munching our way through two dozen lettuces! Next, let us see what evidence there is to support the belief that the flesh of animals imparts some of their characteristics to us. Why Blavatsky made this claim without presenting any occult facts to support it is open to question. She may have done so to conceal certain occult secrets. Secrets we are no more permitted to reveal than she was. Not that such secrets support her contention, although it is possible to transmit health or disease from one body to another without any physical contact between them, and perhaps this is what she was hinting at. Our own personal view is that she made this claim with her tongue firmly in her cheek to discourage the excessive meat-eating which was then rampant among her followers. If it were possible to 'assimilate' such characteristics by eating the flesh of animals we should expect to find some evidence of their presence in meat-eaters and their absence in vegetarians, but we do not. Need we give examples? Adolf Hitler was a vegetarian and teetotaler and yet we cannot think of a more aggressive, angry and violent example of a thoroughly UNspiritual man! This also demolishes the claim that eating meat has any 'coarsening' or 'animalising' effect on man. What animalises and coarsens man are the selfish desires and passions of his lower self, especially when these are given free reign. But it is so much easier to blame this on eating meat rather than our own thinking and actions. Just take a pill, or in this case, give up meat and you will be magically transformed into a paragon of refined spirituality, or even a full-blown saint! This is what the average mystic wants, has always wanted, and will always want, the better to avoid having to wrestle with the devil within in the shape of the lower self. Let us turn to the Bible instead to see what good things it has to say about real spiritual progress. In the Gospel of Matthew we may read that: "Not that which goeth into the mouth defileth a man; but that which cometh out of the mouth, this defileth a man" (Matthew 15:11). In other words spiritual progress is gained through the purity and goodness of our thoughts, words and deeds, not in externals. Like Jesus, the Buddha was not a vegetarian. This great Revealer of the Divine Truths taught his disciples that it is the quality of the heart—that is to say our thoughts and deeds—not our diet that determines our spiritual progress and emancipation. Occult science affirms that all material bodies without exception are the vehicles of spiritual beings gaining experience of the physical world and learning their lessons of material existence. Lessons which can only be learned in a body of some sort. When a body has served its purpose it is discarded and new one takes its place. 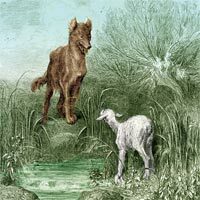 The indwelling spiritual principles which used it are no more concerned with it after its dissolution than you are when you change into a new suit of clothes. One of the lessons of material existence is that there is no such thing as death anywhere in God's universe. There is only change. It is quite impossible to 'kill' anything, be it mineral, plant, animal or man. Incarnation in a physical body involves pain and suffering from its very inception as every mother knows. But we know very few parents who would forego the joy and instruction a child brings to its mother in order to avoid the pain of childbirth or the stress and trauma of dealing with unruly teenagers! In short, it is necessary for the indwelling spirit to suffer in order to learn its lessons, just as it is necessary to dwell in, or have some knowledge of the dark, in order to appreciate the Light. There has never been a genuine spiritual teacher or philosopher who did not teach this truth. It was taught by both Jesus and the Buddha, and later by Plato and Pythagoras. All these philosophers taught that God infused a portion of His own Divine Spirit into matter, and that this spirit moves and animates every particle of it, whatever form that matter may adopt. We hope that what we have said so far has given you every reason to accept that spiritual progress depends on our thinking and acting and not on what we do or do not eat. What of psychic abilities? Can they be developed and enhanced by adopting a vegetarian diet? The short answer is an emphatic 'no'. 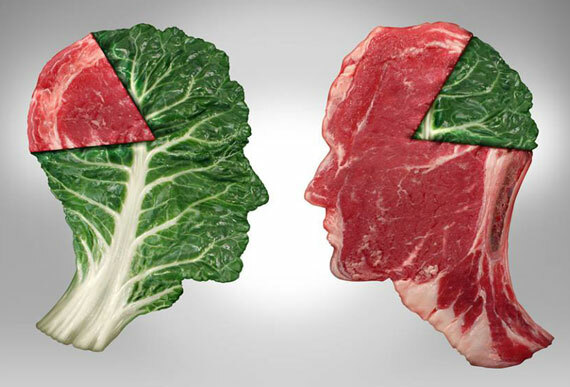 Despite what you may have read or heard to the contrary vegetarians are no more likely to have or develop psychic abilities than meat-eaters. There are certain plants, some of which are known to science, which can arouse the latent psychic abilities we all possess, but the use of them is fraught with danger for the unwary and inexperienced dabbler, who is just as likely to precipitate a full-blown psychotic episode as a spiritual vision. In any event, there is nothing to stop the meat-eater from imbibing the same plant-based potions without giving up his Sunday roast. To stem the howls of protest from any vegetarian psychics among our readers we would point out that vegetarians are statistically more likely to suffer from nutritional deficiencies which weaken the body. Anything that weakens the body may also free the mind. This is the reason why many religious mystics fast, shamans dance (or drink) themselves into a trance, and ascetics the world over torture and starve their bodies in various ways. We hope you will agree with us that with the exception of fasting, none of these practises are likely to lead to spiritual enlightenment, though they may lead to psychic experiences of all sorts, not all of which may be either welcome or elevating. Fasting does not only mean refraining from food entirely for shorter or longer periods, but moderation in lifestyle and diet too. This is the original meaning taught to the students of the Mystery Schools of ancient Greece and Egypt, since distorted into complete abstention from eating, just as chastity once meant wise control of sexual desires, not complete abstinence. Self-control and moderation practised over many years became habitual in the pupils of these schools, so that it was easy for them to free their minds from their bodies whenever they wished without the need for potions, mortifications of the flesh, or a diet of radishes and onions. We would add that psychic abilities have little or nothing to do with spirituality. It is perfectly possible to develop very great psychic powers, such as clairvoyance, clairaudience and even the ability to control the minds of others without possessing an ounce of spirituality, much less wisdom, as you can read in The Quest of Ruru by J Michaud PhD, in which he describes a powerful black magician and his arts. At the beginning of our investigation we said that some people believe that it generates 'good' karma to avoid killing animals for food. We discuss what Karma is and isn't in our occult studies course article of the same name, so we won't repeat ourselves, except to say that there is no such thing as Karma as it is generally MISunderstood in both the West and the East. If a vegetarian diet did improve a person's non-existent Karma, we should expect to find a higher proportion of compassionate, broad-minded, generous, selfless, forgiving and thoroughly good people among plant-eaters than meat-eaters. But do we? Remember Adolf Hitler mentioned earlier! If you doubt us, please take a long, hard look at those of your friends and acquaintances who are vegetarians and compare then to their carnivorous counterparts to see what the differences between them are, if any. Incidentally, recent studies have shown that a tendency to irrational anger is a symptom of low vitamin B12 levels which are more common in vegans and vegetarians. Many vegetarians use the argument that eating meat encourages an industry that causes cruelty and death to millions of animals and a truly compassionate person would wish to mitigate all this suffering. On the face of it this seems a compelling argument, but as we shall see it is not quite as clear-cut as it appears. Other vegetarians use the Eastern concept of "Ahimsa", which Sanskrit word means not to injure or do harm, as a moral justification for not eating meat. If we take this concept to its logical conclusion none of us would ever get out of bed in the morning in case we should inadvertently step on a spider which had taken up residence on the bedroom or bathroom floor! Some Eastern sects such as the Jains go even further by sweeping the ground in front of them lest a stray insect be destroyed in their path. What of the millions of invisible microbes that cover every inch of the planet's surface; are they not also worthy of not being injured? Let the religious fanatics answer, for such extreme practices are nothing more than self-indulgent sentimentality and wrong-headedness. Ahimsa does not mean 'not to injure' as many New Age mystics have been taught to believe, but compassion in thought and deed. There are many times in our lives when we are compelled to injure someone or something in order to alleviate want, distress or suffering, of which the dentist's drill is an example we are all familiar with. All that Ahimsa really means is that we should not inflict deliberate cruelty on any living thing. Deliberate cruelty such as we sadly witness throughout the world, whether between individuals, nations at war, or in pursuit of so-called 'blood sports' is quite different from killing an animal for food, provided it is done out of necessity and as painlessly and quickly as possible. As we said earlier, all bodies without exception feel pain. There is no escape from this fact of material life. We know to a great extent what animals feel because we are higher animals ourselves so far as our bodies are concerned. We know little about the feelings of plants and almost nothing about the feelings of stones, though they MUST have feelings too, for where there is consciousness there must be sensation, and one sensation common to all living things is pain. As the various scientific studies we cite in our Further reading show, Scientists now know that plants can see, hear, smell and feel, though they do not know exactly how these senses operate. Plants can mount defences when under attack, and even warn their neighbours of potential dangers and predators. This supports the hypothesis that plants have consciousness and memory, which Occult Science has always known, and science is belatedly discovering too. Where there is consciousness there must also be the ability to think and feel—however rudimentary—though at present this is a leap too far for most scientists. In one recent study, scientists found that lettuces respond to the specific sounds caterpillars make when eating them, and retaliate by releasing certain chemicals to defend themselves from further attack. Is this a response to pain? We would argue that it is, though science is still undecided. Such research has prompted one wit to remark that meat-eaters may actually be more humane because they kill their food before eating it whereas vegetarians either cut their food to pieces or boil it while it is still alive! Joking aside, it must now be clear to you that there is no difference in kind between killing a lettuce for food or killing a cow. It is only a difference in degree because we regard a cow as a higher form of life than a lettuce. Whether the Creators make the same distinction is something we leave you to ponder. In either case, the only thing 'killed' is the material body of the indwelling spiritual principles which previously inhabited it, who are now happily released from their erstwhile prison. Moreover, it is an occult scientific Law that Life feeds on Life. Shakespeare, as an occultist clearly knew this, for he tells us in the words of Hamlet: "Your worm is your only emperor for diet: we fat all creatures else to fat us, and we fat ourselves for maggots." This Law applies throughout the manifested universe, from atoms to Angels, however unpalatable it may be to those zealots who embrace vegetarianism as a dogmatic religion, rather than through economic necessity or life-style choices. This at once demolishes the specious argument that a vegetarian is any more moral than those who choose to eat meat as part of their diet. Both have to kill what they eat and both obey the same universal law in doing so, by consuming the material forms which life inhabits, whether they happen to be cabbages or cows. So much for the moral arguments in favour of vegetarianism—what of the economic reasons? Some vegetarians claim that animals require land that could be more productively used to raise crops to feed starving people in Third World countries. It is also claimed that feeding animals contributes to world hunger because livestock are eating food that could go to feed humans. These arguments ignore the fact that two thirds of the Earth's land surface is unsuitable for farming crops, whereas much of this land is suitable for animal grazing. Another fact rarely mentioned by vegetarians is that more than 15 million tons of food is thrown away each year in the UK alone, almost 50% of which comes from our own homes! What is more, as much as 40% of all UK vegetable crops are either not harvested or destroyed because they fail to meet the exacting standards demanded by supermarkets in the mistaken belief that consumers demand 'perfect' fruit and veg. Here are a few more facts for vegetarians to consider. Fruits and vegetables have the highest wastage rates of any foods. Over 40% of all lettuce is thrown away before it is eaten. A staggering five million potatoes, four million apples and 1.5 million bananas are thrown away untouched every day in the UK. The average family in the UK throws away a week's worth of fruit and vegetables every month. By comparison, meat and fish account for just 3% of all food wasted, and dairy and eggs even less at 1%. The total amount of food thrown away world-wide each year is estimated to be TWO BILLION tons—enough to feed half the world's population—yes half! These are truly shocking facts which are only now becoming more wildly known, yet little is being done by governments, wholesalers or consumers to stem this obscene tide of waste. Why, in the face of these facts, millions do not have enough to eat is a question outside the scope of this article, but it is clear that meat-eating cannot be blamed for it. The only area in which morality may be said to play a part is the manner in which food is killed and eaten. This is reflected in the custom, once common to all civilised peoples, of saying 'grace' before meals in gratitude for that which was to be received in the way of bodily nourishment. Some so-called UN-civilised nations, such as the Red Indians of North America, went further and prayed to the spirits of the plants or animals whose bodies they were about to kill. In this they demonstrated their superior civilisation and knowledge of the occult Truth (whether consciously or not) that matter and spirit are two distinct and separate principles, though united for a time in a material body. It is a very great pity that this custom and the wisdom behind it have now been largely lost. In place of reverence for the principle of Life Eternal we have substituted an almost pathological obsession with the preservation of the perishable forms that life enters into. This has led to a sentimental attachment to the body which is out of all proportion to its true purpose, which is a vehicle for the spirit. A very wonderful and oftimes beautiful vehicle it is true—as you can read in our occult studies course article on Evolution—but of no more concern to the indwelling spirit once it has left it behind than a worn-out suit of clothes is to us. If people would only realise this simple Truth the arguments for and against vegetarianism would cease, for all would know that there is no escape from pain or suffering for any being so long as they inhabit a material body. This was the essence of the Buddha's teaching, as it is the essence of the teachings of all the great Masters and Messengers from God to man. We have now seen that the assumptions with which we began this investigation—namely that a vegetarian diet is essential for spiritual progress; that it can develop and enhance psychic abilities; that it produces 'good' karma and mitigates suffering—are all based on misconceptions. This does not mean that we condone the cruel ways in which many animals are reared and slaughtered nowadays. On the contrary, we abhor 'factory-farming' and the greed and selfishness of those who promote and sustain it. We all have a responsibility to respect and nurture life in whatever forms it manifests itself. Moreover, there is no good reason why animals cannot be reared and slaughtered humanely. This is why organic agriculture and meat production is something all thinking people—whether they are meat-eaters or not—might encourage and support more than they do. Sadly, there are as many vegetarians as meat-eaters who are quite happy to continue to consume the products of intensive, factory-farming, so long as it means their food remains cheap. None of this should blind us to the truth that pain, be it ever so slight and brief, is an unavoidable concomitant of death, especially when death occurs through the application of sudden force to the body. One could argue that by adopting a vegetarian diet, one is actually contributing to the inhumane treatment and slaughter of animals. For it is only the most sensitive and evolved of human beings who give any thought to the sufferings of others, be they their fellow human beings, animals or any other form of life. Most people couldn't care less, so long as their steak is juicy and their lettuce is crisp. If all sensitive and caring people were to become vegetarians, the appalling conditions in which many animals are kept and the stress, fear and pain they suffer when they are killed will continue and may even get worse. © Copyright occult-mysteries.org. Article added 30 August 2015. Updated 7 April 2018. Whilst the primary aim of this investigation is to present the facts of vegetarianism in the light of spirituality it is appropriate that we consider physical and mental health too, for the benefit of those who may be conflicted about the pros and cons of a vegetarian diet. During the past few decades the idea that vegetarianism is a healthier dietary option has become increasingly popular. Many nutritional 'experts' and government health agencies now urge people to eat fewer animal products and consume more fruit and vegetables, the well-known 'five-a-day' being a good example of these exhortations. This is all very welcome IF it encourages people to eat a more balanced and healthy diet, but along with the good advice have come studies purporting to prove that meat consumption is associated with sickness and death or that vegan diets lead to severe nervous and digestive system damage. Both these claims are false, but such is the emotive nature of the subject that each faction resorts to the worst type of scare mongering to support its case and demolish any opposition to it. Having said that, various hormones, nitrates and pesticides are present in commercially raised animal products. But they are also present in intensively-farmed cereals, fruits and vegetables. It is not that difficult to avoid these chemicals if one tries to consume mostly free-range organic produce, whether it is meat, eggs or cereals, fruits and vegetables. According to a recent studies (see further reading list below) vegetarians may suffer significantly more often from mental disorders and/or depression linked to their diet. Some studies have shown that two out of three vegetarians may be vitamin B12 deficient compared to only one in 20 meat eaters. Mineral deficiencies are also common among vegetarians, one of the most significant of which is iron deficiency which can cause anaemia. On the other hand, studies have also shown that vegetarians are up to 40% less likely to develop cancer than meat eaters. A vegetarian diet may also help to lower blood pressure, prevent hypertension, and reduce the risk of stroke. Unfortunately, very few of these studies take into account the very wide variety of different lifestyles among research subjects. Factors such as smoking, alcohol consumption, exercise, obesity and inherited or acquired medical conditions play as important a role in health as diet, if not more so. For these reasons it would be quite irresponsible to say that a vegetarian diet is inherently more or less healthy than one that includes a moderate amount of meat, fish and dairy produce. We say 'moderate' deliberately, for excesses in any form are invariably harmful, as we pointed out in our article at left, whether it is drinking 20 pints of carrot juice a day or eating steak for breakfast, lunch and dinner! One thinking scientist summed up the pros and cons of vegetarianism very well when he wrote: "Humans have always been meat-eaters. The fact that no human society is entirely vegetarian, and those that are almost entirely vegetarian suffer from debilitated conditions of health, seems unequivocally to prove that a plant diet must be supplemented with at least a minimum amount of animal protein to sustain health. Humans are meat-eaters and always have been. Humans are also vegetable eaters and always have been, but plant foods must be supplemented by an ample amount of animal protein to maintain health." We agree with this sensible statement and no thinking person could possibly object to it. We are not going to give you any practical suggestions as to what you should or should not eat. Firstly, because as we say in our investigation, diet is a matter of personal choice, and secondly because we are not qualified to give such advice. There are plenty of books to be had on the subject of diet and nutrition written by health professionals—from the basic to the highly scientific—to suit all tastes and pockets in which this information can be found. Moreover, many foodstuffs now state the vitamins, minerals, proteins, carbohydrates and fats they contain, so it has never been easier to choose and maintain a healthy diet. Nor should cost be a factor in eating healthily, for many of the most essential vitamins and minerals, etc., are found in inexpensive foods such as potatoes, eggs, cheese, fish, cereals and pulses. But please be alert for the slightest tinge of fanaticism in any books or websites dealing with diet, health and nutrition, for this is a sure sign that the authors have a personal agenda which may invalidate much, if not all, of their advice. Fanaticism is a vice many ardent vegetarians suffer from, as a recent email from a reader confirmed when she complained about a friend "bombarding" her with information about the virtues of vegetarianism and the evils of eating meat. Ironically, we rarely hear of meat-eaters adopting a similar aggressive position in regard to their dietary choice! We wonder why that is? We came across a classic example of this fanaticism in a vegetarian newsletter whilst researching this investigation. We quote: "Most people don't realise that meat products are loaded with poisons and toxins! Meat, fish and eggs all decompose and putrefy extremely rapidly. As soon as an animal is killed, self-destruct enzymes are released, causing the formation of denatured substances called ptyloamines, which cause cancer." Whilst this is a somewhat extreme example of the scare mongering cant and almost religious fanaticism of some vegetarians, there are many other similar statements to be found in books and online which are rather more subtle but no less misleading and dangerous. So do use your critical thinking when reading anything about this subject and take as your guide the sensible words of the philosopher A. N. Whitehead who said: "An unflinching determination to take the whole evidence into account is the only method of preservation against the fluctuating extremes of fashionable opinion." And, we might add, against religious fanaticism, whether in regard to diet or spirituality! To conclude, so long as we eat a wholesome, balanced diet, preferably of organically-produced food, which provides the correct combination and amount of carbohydrates, proteins, vitamins and minerals needed to maintain bodily health and vigour it does not matter from what sources we obtain our food. If this investigation has encouraged you to think more deeply about the many myths and fanciful notions that surround the subject of vegetarianism and spirituality, you may find the popular and scientific sources cited in our further reading list below of interest. In this article we discuss the often conflicting desires of the Higher and lower selves and examine how we may attain that equilibrium between them which is surely the goal of all sincere seekers after truth. In this article we discuss health and medicine from the perspective of occult science, and consider some of the better-known alternative therapies which you can use to help yourself to health and stay well. In this short article a medical herbalist and naturopath gives a sane and sensible overview of vegetarianism and spirituality which should appeal to every open-minded reader. A Meat-Eating Yogi: Is a Veggie Diet the Only Option for a Spiritual Person? This honest, personal testimony from an ex-vegan demonstrates that it is possible to live a spiritual life without becoming a vegetarian. Vegetarianism and Buddhism by the Venerable K Sri Dhammananda Maha Thera. In this short article a Buddhist argues that "One should not judge the purity or impurity of man simply by observing what he eats." We say the same in our article at left. In this short article, the authors debunk the myth that a vegetarian diet is necessary to become enlightened. The Secret Life of Plants by Peter Tompkins and Christopher Bird. Although published in 1973, this book remains a classic of its kind and was responsible for the concept of plant sentience which has since sparked the new science of plant neurobiology. by Dr Stephen Byrnes. Originally published in The Ecologist Volume 29 Number 4, July 1999. In this article Dr Byrnes seeks to dispel 12 common arguments used by vegetarians and vegans to support their belief that meat-eating is unhealthy and harmful to the environment. Whilst we do not necessarily agree with all the author's assertions, his article is well worth reading for his balanced and calm investigation of this controversial subject. Vegetarian diet and mental disorders. This German study published in the International Journal of Behavioural Nutrition and Physical Activity in 2012, concluded that pre-existing mental disorders increased the chance of choosing a vegetarian diet, and that vegetarianism increased the probability of developing a mental disorder. Do Plants Think?. In this article published in 2012 in Scientific American, plant scientist Daniel Chamovitz unveils the surprising world of plants that see, feel, smell and remember. Plant Consciousness. Fascinating evidence gathered from many different scientific studies that show plants may have human level intelligence, feelings, and experience pain. This article from the New Yorker, published in 2013, shows that plants have electrical and chemical signalling systems, may possess memory, and exhibit intelligent behaviour in the absence of brains. A new study published in Annals of Botany in 2017 shows that plants react to anaesthetics similarly to the way animals and humans do. Practical advice from the Friends of the Earth website about food waste and how we can stop it. Organic Farming Can Feed The World. Soil Association article about new scientific research which shows that organic farming can feed the world.